After a recent trip the Air and Space Museum’s Udvar-Hazy Center, my husband had a 3D Printing request for me. 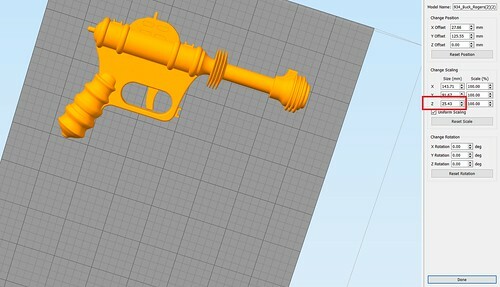 He wanted a 1934 Buck Rogers Disintegrator Gun. Thanks to the great community up on Thingiverse, I didn’t have to do any modeling. I had THREE Buck Rogers Guns to choose from. 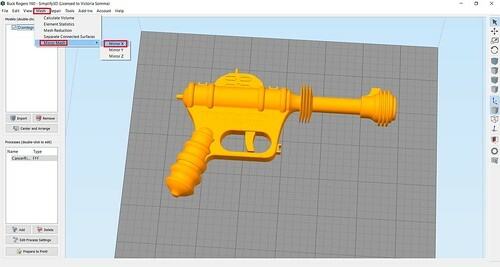 The one that caught my eye and seemed to most resemble what my husband wanted was “Disintegrator 1934 Buck Rogers Gun” by user bluesroq. 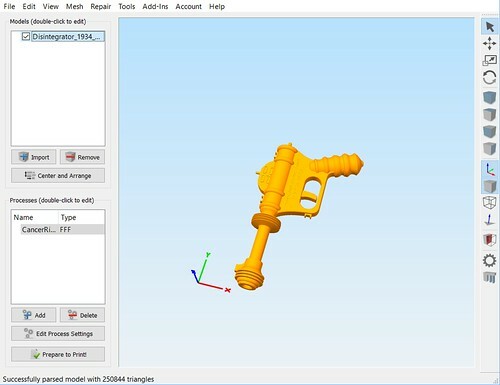 The designer recommended printing the model with supports and there is indeed a lot of overhangs with how the gun is positioning now. 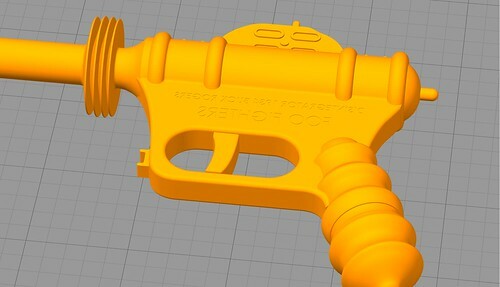 As great as Simplify3D supports are, they would still leave some scarring or souvenirs on the faces– in this case– an entire side of my gun would be subject to that and not look as pretty and finished as the other side. Supports increase your printing time AND your material usage. 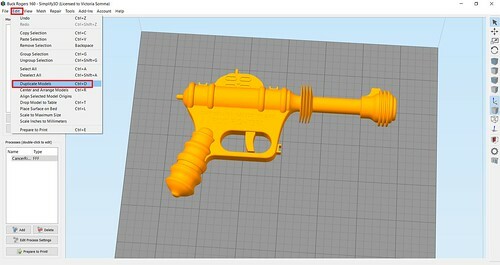 In the case of an adult-sized Buck Rogers gun, the print time would have gone from 4 hours 30 minutes to 7 hours 12 minutes! If it were in half, this particular model would be an easy, straight forward print without any troubling overhangs. First off, it is helpful to see the build plate while you are working. 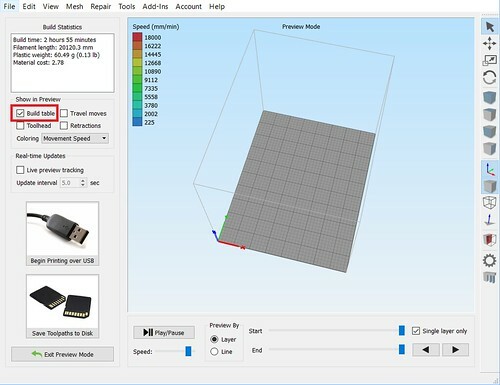 If yours is not displaying in your Simplify3D, click on Prepare to Print and check the Build Table under Show In Preview. Next we need to figure out how far we want to lower our model. 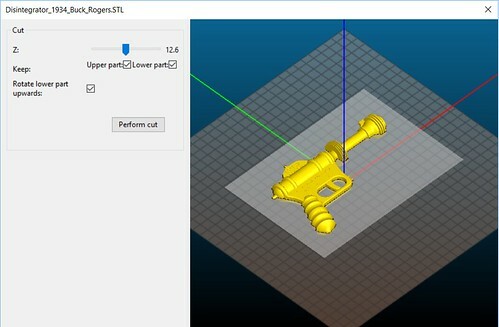 Simplify3D makes that easy for us as well. Double click on your model and in the information panel under the Change Scaling section, we will get a reference of the exact measurements. In this case, we are interested in the height of the model, the Z value. Now we have some simple math. We want to lower the model so only half of it is above the print bed. That means we want to divide the height by 2. In this example– 25.43 divided by 2 is 12.71. In our Change Position section, we want to change the Z offset to -12.71 (aka Lower the model 12.71 mm). At this point, half of our model is under the print bed! If we click on Prepare to Print, you’ll see that only half of the model is going to be printed. 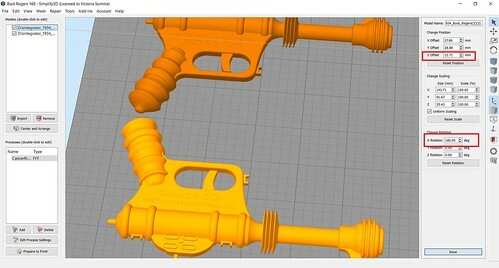 To make a whole gun, we obviously want to print two halves of the gun. Click on your model to select it and then go to Edit->Duplicate Models and make one more copy. You may have to move it around to a better spot on the build plate. (You can also click on the Center and Arrange— but you’ll have to reset your Z Offset again for the original model). Now we have to flip our new part. Gotcha– Watch Out for Mirroring! My first inclination was to go Mesh->Mirror Mesh and mirror my second half over the X or the Y axis. That could work for some models, but in the case where there is text on your model (like this), then that also mirrors your text and it too would be backwards. Mirroring should also be avoided if your model isn’t exactly symmetrical and has different detailings on each side. In lieu of mirroring, you can rotate it! 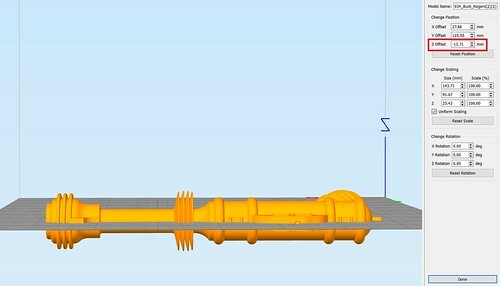 Double click the object and then in the Change Rotation section, rotate the model 180 over the X or Y axis. Don’t be alarmed if your object suddenly “disappears”. It’s actually underneath your print bed. You just have to adjust the Z Offset now to move the new one 12.71 above the print bed. And there you go, you can break your model up without modeling software like Blender. This technique’s applications are not limited to merely cutting objects in half. 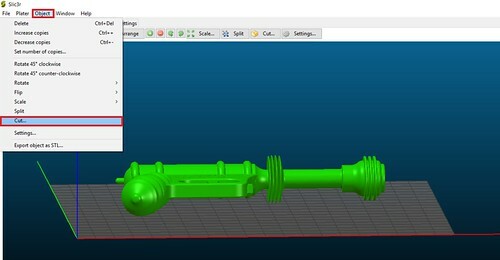 You can use it anytime you want to isolate out a particular section of a model to print. Say you got a 3D Hubs order and you are worried about a tricky section near the top. You don’t have to waste the time and material to run the whole print to find out that section is going to fail. 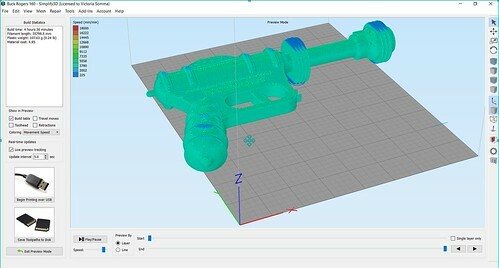 Instead, you can lower your object down and do a quick print on just the troublesome section to see how it performs.